Thanks for stopping by! I hope that the information contained in this article has been helpful when trying to figure out some of the habits of house centipedes. For more information as well as some handy facts on how to get rid of these creatures, this instant downloadable e book may come in handy: House Centipede Control - Get Rid of House Centipedes Once and For All or if you are a big fan of Dr Bader, here is one of his famous pest removal paperback books: 1001 All Natural Secrets To Pest Control - Dr Bader's Guide for removing crawling, flying, burrowing, or sneaking pests from your home. What a Weird Looking Little Creature! House centipedes are yellowish gray in color and are about 4 inches long. They have up to 15 pairs of legs and can move extremely fast. You can find them running across the floor, or even crawling up the wall. When these bugs are standing still, you can hardly tell the back from the front because their front and back appear so similar. Once you startle them however, you will notice just how fast these little guys get around. They will move forward as fast as they can, and can stop suddenly and remain motionless for a short time, only to begin moving rapidly forward again. Kind of neat to watch! 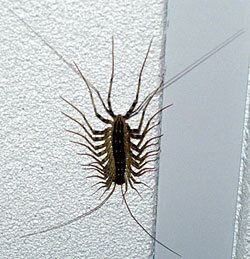 House Centipedes live in the dark or moist areas of your home. They tend to hang out in basements, bathrooms, and even in dark corners and closets. You are more likely to see one of these things in the spring when the weather begins to warm up, and in the fall when they are searching for a good place to hide out in your home so that they do not end up out in the cold winter weather. These creatures are pretty common and although seeing them may freak you out a bit, the bigger problem lies in the fact that seeing a house centipede actually can be a sign for a bigger problem..... they are there because they have lots to eat, and they eat other household insects, so you have other pests that will also need delt with in addition to your resident centipede. Centipedes eat other small insects such as bed bugs, spiders, and even bees. So although they are great for getting rid of these other insects, unless you want to live with common house centipedes running around your home, you will have to exterminate their food source as well. 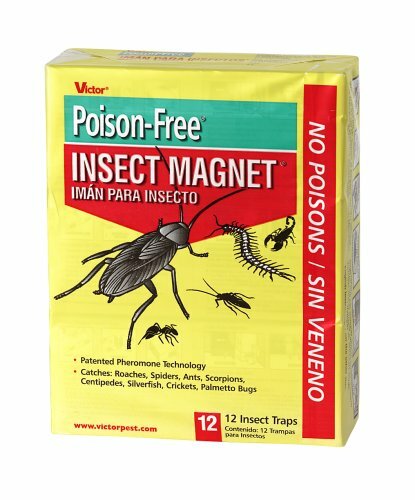 Each of these 12 traps are small enough to fit into tight places, but effective enough to get the job done without poison.